Here’s an updated section on how to download Mi PC Suite for Windows. You may view the old version of the article after this section. However, please note that Xiaomi stopped supporting the client. Hence, it doesn’t work for most up to date phones. For example, if your Xiaomi smartphone is running Android 6.0 Marshmallow, the client won’t work. Connect Xiaomi Smartphones To Windows PC. Did you try to install Xiaomi USB drivers and still cannot connect your smartphone to your PC? Then, when you install Mi PC Suite, it takes care of this for you. Firstly, download the installer from the official website (pcsuite mi com) or forum. There’s also an alternate version that claims to be an updated version here. By clicking any of the above links, you go to the download page for the software. Although, the last link starts the download automatically. Once the download completes, proceed with the installation instructions. Once the download finishes, run the installation file. Follow the on-screen instructions to proceed to install Mi PC Suite. Lastly, click finish to complete the install. Launch the application by clicking the desktop shortcut. Mi PC Suite: The Mi PC Suite is a good piece of software to have, along with the Mi Flash Tool, if you own any of the Mi smartphones, like the Redmi Note 4 or Redmi 1S. This is the official English MiPhone Manager. Now, with the MiPhone Manager or Mi PC Suite, you can control your Xiaomi smartphones via computers. The app makes file transfers, backups and easier. Users can also send text (SMS) messages from their PC, create notes, take screenshots etc. You can also use the app to fix bricked Xiaomi smartphones. However, before we begin, here are a few things to know. Go to the MI page and register an account to download the MiPhone Manager. After installing, connect your Xiaomi device to the PC via the USB cable that came with your specific device. Now, you can use the app without having to search for mi PC suite language change because of it’s already in English. As a Mi Phone owner, this is one of those applications that will come in handy. This is especially true if you frequently transfer large amounts of data between your Mi Phone and computer. Under My Devices, there’ll be several tabs on the right that allow you to change/access files from your phone. Enjoy the Mi PC Suite or MiPhone Manager. Now you can easily uninstall and upgrade apps, upload and play music and video files, manage contacts and SMS among other things. Thanks for reading how to download and install the Mi PC Tool on Windows computers. 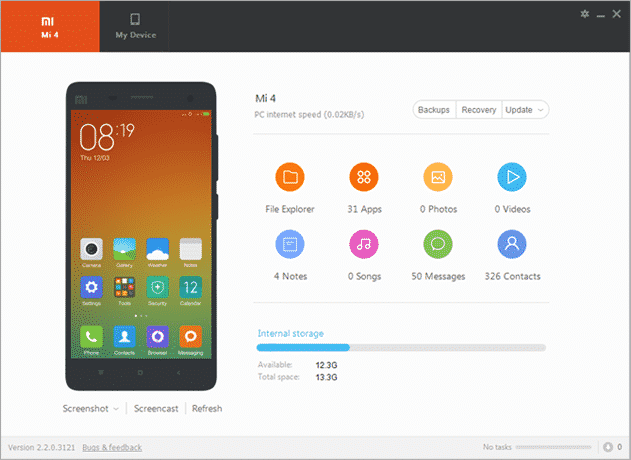 Jay Kapoor: So, finally, Xiaomi Released their Official Mi phone Manager/Mi Pc Suite in English. In this Video, I will show you how to install it and What You can do with this software. What Resolution to Choose to Get Maximum Pleasure from Gaming?